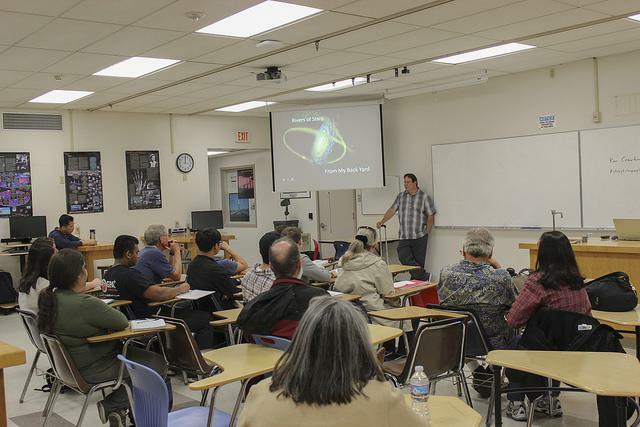 “How many of you have ever seen a star up close?” asked Ken Crawford, an award-winning astrophotographer who led a workshop April 27 as part of American River College’s science series. Crawford, who has been shooting space as an amateur for over 20 years, began the presentation by showing what he called “pretty pictures” starting with the earliest preserved astrophotography, dated to the 1800s. He then aligned them with recent photos of the same stars, displaying just how far the technology has advanced. Using that as a segue, Crawford talked about his personal story, including that he had never gone to college. Crawford has his own personal robotic telescope at home, and also works out of the Rancho Del Sol observatory. After showing the equipment used at various observatories around the world, he then explained the process of working with it and how the many telescopes differ from everyday DSLRs or iPhone cameras. Using photos taken using a stationary telescope, Crawford shared how the rotation of the Earth, as well as your position on it, can effect the star patterns that are visible. Working at an observatory in Australia, he had seen and photographed stars not visible north of the equator. Stars aren’t the only thing visible – there are also gas structures building up. “They make amazing structures and can be quite beautiful,” Crawford said while displaying a photo of “Elephants Trunk”, a structure he photographed while working in Australia. Crawford said what you see through a telescope isn’t always immediately visible in photographs. Light, noise and the slightest movements all affect the extremely sensitive photographs pre-processing. Starting with a raw photograph, Crawford displayed “representative colorization,” in which different colors are overlaid to represent various elements in the universe. Sulfer is represented by red, hydrogen by green and oxygen with blue. These colors can also tell the age of a star or its place in the cosmos, with golden stars being older. Every image captured of deep space contains several thousand galaxies and the photos can take days to expose, according to Crawford. “How do you know when to stop the exposure?” asked Nemi McCarter, a computer science major at ARC. For some students, Crawford’s lecture was eye-opening to the potential of space. Be the first to comment on "World-renowned astrophotographer presents at ARC"